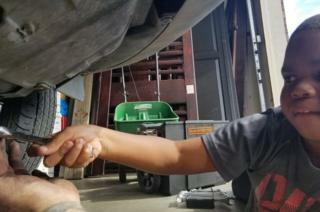 When former paratrooper and helicopter mechanic Adam Ely offered to fix his daughter's friend's car, he had what he calls "a light bulb moment". "It was super easy to do, I saved her at least $80 (£60), and I thought, 'I'd like to do more of this'," Adam, from Oklahoma, told the BBC. Feeling inspired to help more people in need, Adam and his wife, Toni, set up Hard Luck Automotive Services (HLAS) in 2017. "I've never turned anyone away. It doesn't matter about economic status, race, or creed. I don't even care if people take advantage, I will help them, regardless," he said. Image caption Adam: "I have a skill that allows me to help folks - all it takes is time"
Adam, whose premise is, "If you can afford the parts, I'll fix it for free", says he has had requests from people ranging from some in million-dollar houses, to others living in their cars. One very happy customer is single mum Tamesha Rayes, also a veteran, who called on Adam when her car broke down in October 2018. "My car's essential to take my eight-year-old son to school and for me to go to college. I was in a big mess and Adam helped us tremendously. He's a lifesaver," she told the BBC. After Adam explained all of her options, he called around to get the best deals on the parts that she needed and found coupons she could use to bring down the cost. He then got on with the repair work, at no extra charge. "My son Tysen was so impressed as he showed him his tools, and let him help out. He didn't stop talking about him afterwards. He still tells everyone he's going to be a mechanic like Mr Adam!" As a disabled veteran, Adam receives money from the Veterans Association of America, and is studying special education for children with disabilities full-time at college, which means he can dedicate a limited amount of time to HLAS. Fortunately, he has received tools from donors wanting to join in on the kindness and is thankful for what he calls the "army" behind him. Toni maintains their social media accounts and designs their T-shirts to sell to offset some of their costs, while his go-to expert is Matt, whom he calls on when he feels the jobs are "over his head". Speaking on his HLAS Facebook page, he has been sharing how blown away he has been by the messages of gratitude and goodwill and by the charity of others. Many of his local auto-part stores give him a discount, now that they have heard about his work. "It might not help me," says Adam, "but if a single mum, for example, saves $100 on parts, that's the best." "It's such a great feeling to be able to give back to people. I get so much more out of it than they do, to see that their burden is taken off them," Adam explained. Does he receive any tips or gifts for his services? "I've only ever received a tip from two jobs," says Adam. "One gave me $50, and another emptied the contents of his wallet into my hand, which came to $43." "I couldn't fix this man's car so we crowd-funded him enough for a down payment, and tax title and tags." Adam walks with a cane, because of knee and back injuries, but that does not stop him from helping people with their cars. This in turn helps him deal with his flashbacks and other post-traumatic stress disorder (PTSD) symptoms with which he has been coping, since leaving the military in 2007. "Doing this gets me through the PTSD 100%!" And as they explain on their Hard Luck auto website, Adam and Toni do this "because we can". Before 'distracted boyfriend' was there 'distracted girlfriend'?